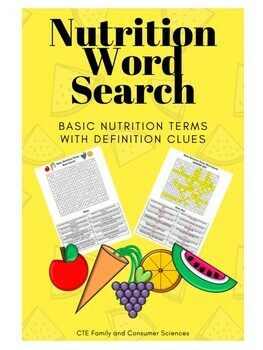 Word Search using basic nutrition terms (calorie, carbohydrates, cholesterol, diet, fat, fiber, menu, mineral, protein, recipe, sodium, sugar, vitamin and water) and definition clues to find the words in the word search. 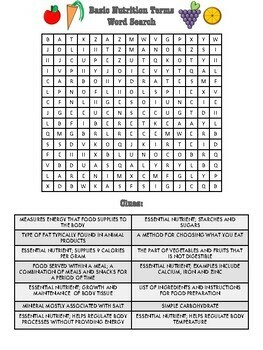 This is a great introductory activity to a Nutrition or Foods class or could be used as part of a test review. 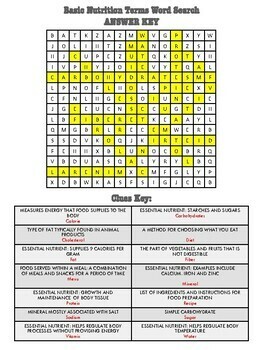 PDF file with answer key included. Food clipart free from Oh So Cute O'Flaherty.